Heat oven to 400°F. Line cookie sheet with cooking parchment paper. Place bread pieces on cookie sheet; spray bread with cooking spray. Bake 8 to 12 minutes, turning halfway through, until toasted. Cool; use as croutons. In large mixing bowl, beat vinegar, mustard, honey and pepper with whisk. Beat in olive oil; blend until smooth. Add kale and shallot; toss until kale is thoroughly coated. Gently mix in strawberries. Divide evenly among 4 serving plates; top with croutons and Parmesan cheese. Serve immediately. 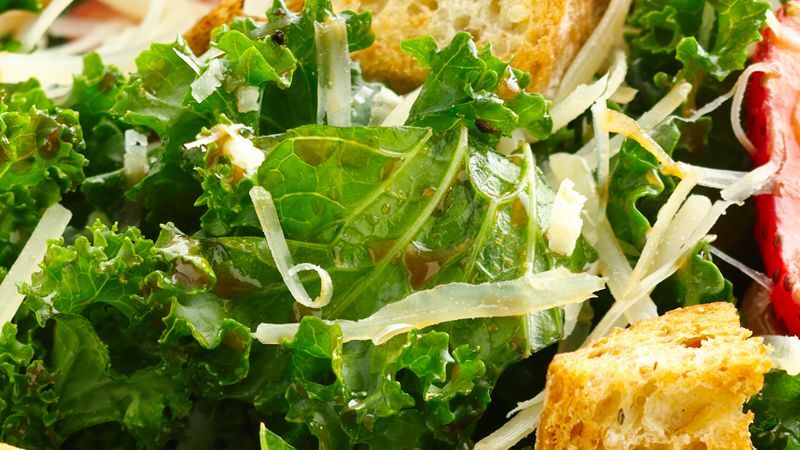 Toss the kale with the dressing the night before, cover and refrigerate. Just before serving, stir in the strawberries, and top with croutons and cheese.